Fissure 8 continues to fountain and spew its miles long river of lava that empties out in the ocean. The eruption is entering its eighth week. It’s been a while since I last did a volcano update. Nothing much has changed as the Kilauea eruption goes. It is nearly eight weeks since eruptive activity started in Leilani Estates. 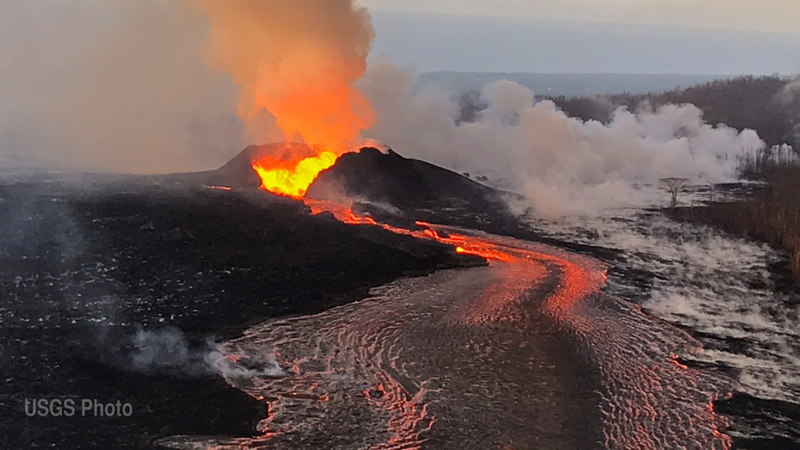 Fountaining and lava continues at the East Rift Zone with Fissure 8 (Pu’u Leilani — my unofficial name) building its cinder cone and sending lava downslope to Kapoho. All of the Vacationland subdivision and several others have been completely wiped. Lava has filled in the old bay with a new 300+ delta building up in its place. The lava flow continues at a steady level. 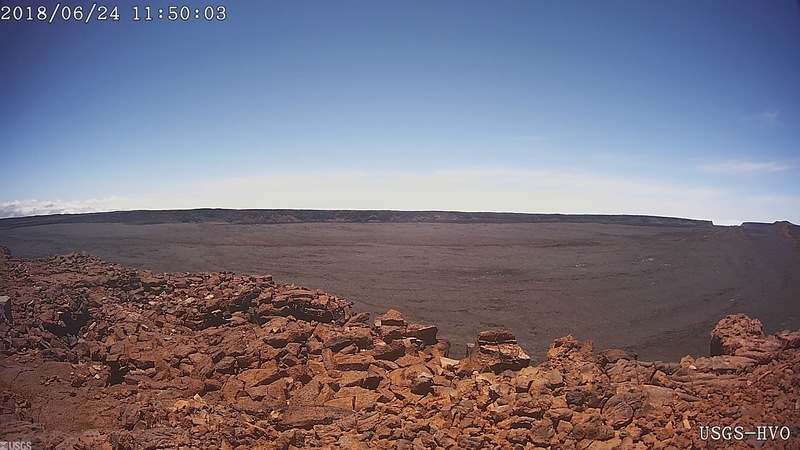 At the summit, Halemaumau crater continues to deepen and expand as its sides have fallen into the caldera. The latest updates on Kilauea volcano’s eruption status can be found at the USGS website. Hawaii County Civil Defense continues to issue daily bulletins to keep the community informed. Homelessness, relocation, and federal financial relief are some of the issues that former residents of the area are dealing with. 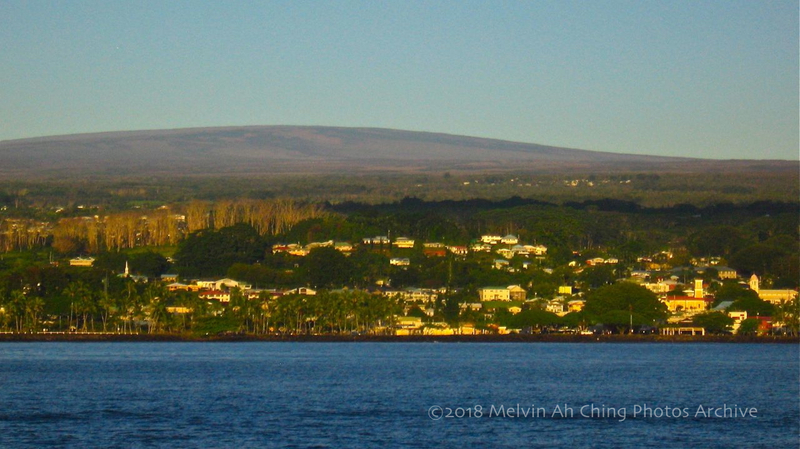 Mauna Loa volcano looms over Hilo town. On another note the USGS Hawaiian Volcano Observatory has reduced the threat level of 13,680 foot high Mauna Loa volcano from “Advisory” (yellow) level to “Normal” (Green). The normalization of Mauna Loa’s status is attributed to seismic levels are “no longer at an elevated level of activity.” A reduced rate of earthquakes over the last six months are one of the factors contributing to the normalization. Mauna Loa last erupted for 22 days in 1984 sending a lava flow to within 4 miles above Hilo town. Eruptions of Mauna Loa tend to produce much more lava than Kilauea and can impact many communities to the northeast, east, south and southwest of the volcano. 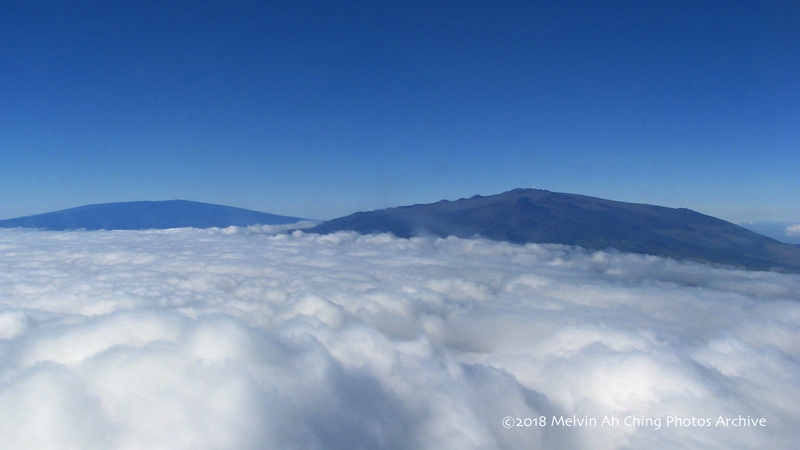 Mauna Loa volcano (left) and Mauna Kea (right) in this aerial photo from 2009. Volcanic Activity Summary: HVO seismic and deformation monitoring networks have been recording near background levels of seismicity and ground motion at Mauna Loa Volcano for at least the last six months. These observations indicate that the volcano is no longer at an elevated level of activity. Accordingly, HVO is dropping the Mauna Loa alert level to NORMAL and the aviation color code to GREEN. Remarks: From 2014 through much of 2017, HVO seismic stations recorded variable, but overall elevated rates of shallow, small-magnitude earthquakes beneath Mauna Loa’s summit, upper Southwest Rift Zone, and west flank. During that same time period, HVO measured ground deformation consistent with input of magma into the volcano’s shallow magma storage system. These observations indicated that volcano was not at background levels of activity and the volcano alert level was raised to ADVISORY and the aviation color code to YELLOW in September 2015. It was noted at the time that the increase in alert level did not mean that an eruption was imminent or that progression to an eruption was certain. Indeed, this episode of unrest lasted several years without progressing to an eruption, similar to the period of unrest from 2004 to 2009. Since late 2017, rates of earthquake occurrence and of ground motion related to inflation of shallow magma reservoirs have slowed to near background levels. Seismicity has continued to be low during the current activity on Kīlauea volcano. Recent motions recorded by GPS instruments on Mauna Loa are due to the M6.9 Kīlauea south flank earthquake on May 4, 2018 and subsidence at the summit Kīlauea Volcano. None of the activity on Kīlauea volcano has had a detectable effect on Mauna Loa’s magmatic system. Mauna Loa is the largest active volcano on Earth. Eruptions typically start at the summit and, within minutes to months of eruption onset, about half of the eruptions migrate into either the Northeast or Southwest Rift Zones. Since 1843, the volcano has erupted 33 times with intervals between eruptions ranging from months to decades. Mauna Loa last erupted 34 years ago, in 1984. Mauna Loa eruptions tend to produce voluminous, fast-moving lava flows that can impact communities on the east and west sides of the Island of Hawai`i. Since the mid-19th century, the city of Hilo in east Hawai’i has been threatened by seven Mauna Loa lava flows. Mauna Loa lava flows have reached the south and west coasts of the island eight times: 1859, 1868, 1887, 1926, 1919, and three times in 1950.